Thick and Creamy Sweet Corn Chicken Soup is an Indo-Chinese Soup that takes just 20 minutes to make from scratch. 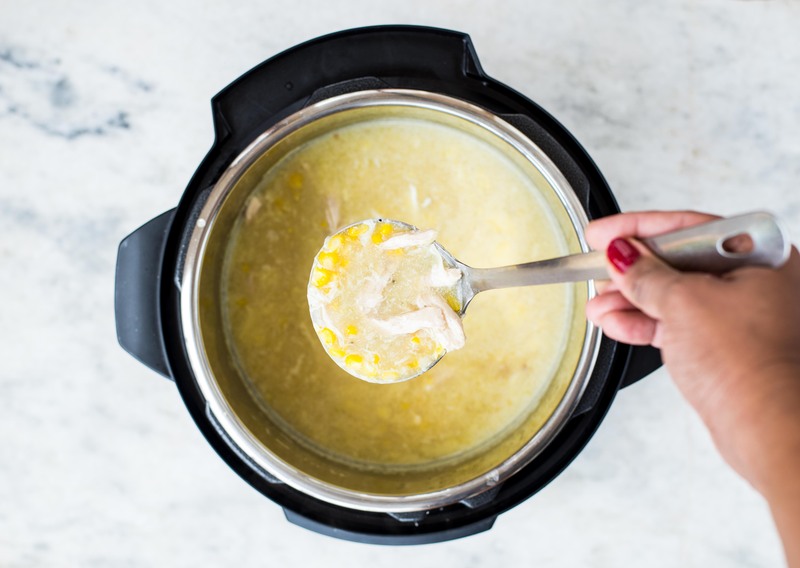 Watch the detailed video to learn how to make this easy Corn Chicken soup in an Instant Pot. Stove Top instructions also included in case if you don’t have an Instant Pot. Imagine a cold winter night and you are sitting on your couch wrapped in a cosy blanket and having this creamy Sweet Corn Chicken Soup. Sounds comforting, isn’t it? This soup is exactly what you would be craving in winter. Thick and creamy with juicy Chicken and Sweet Corn, this soup is very satisfying. Growing up sweet corn soup used to be one of the frequently ordered soups in restaurants. Because this soup is slightly sweet and has mild flavours. I love corn a lot, so one more reason to love this soup. Now that I have a toddler at home, this soup works best for the whole family. You can always sneak in vegetables like carrot, peas, Mushroom in this soup. But I prefer it the classic way. WHAT GOES INTO SWEET CORN CHICKEN SOUP? I always have some chicken breast lying in the refrigerator and it comes handy when you are clueless about what to make for dinner. Recipes like HONEY GARLIC CHICKEN and CREAMY BALSAMIC CHICKEN AND POTATOES are a few of my favourites. 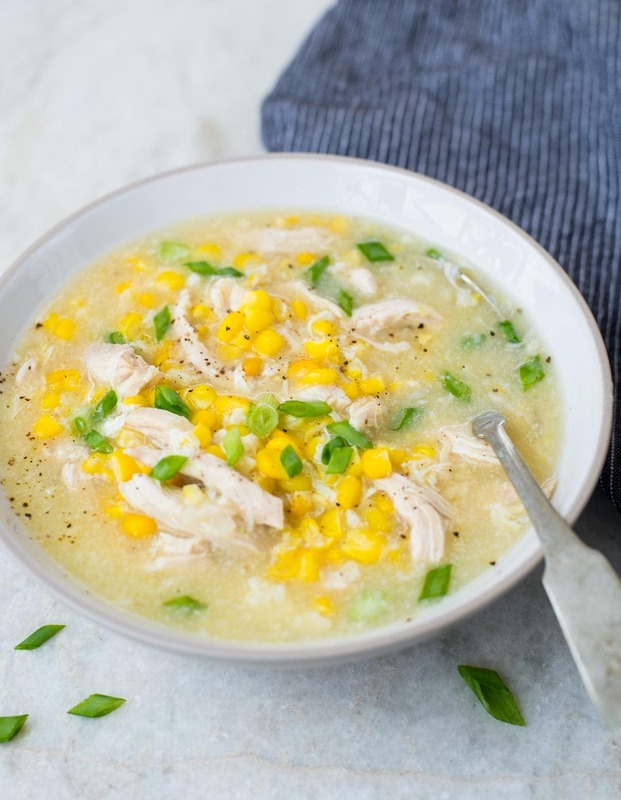 This Sweet Corn Chicken soup is another such recipe, that gets ready in no time. And if you are using Instant Pot, then your effort reduces by half. Chicken breast is cooked in Onion, ginger garlic and Chicken broth for extra flavour. Creamed corn makes the soup more creamy and rich. Another key ingredient in this soup is the egg. When the egg is slowly whisked into the simmering broth, it creates ribbon-like structures and gives the soup some body. 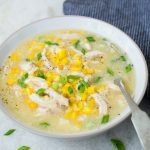 This Sweet Corn Chicken Soup is mildly seasoned with salt, freshly cracked pepper and soy sauce. CAN I USE FROZEN CHICKEN BREAST? Without any doubt, you can use frozen chicken breast in this recipe. That’s the beauty of using Instant Pot. Cooking frozen chicken breast in an instant pot is quite convenient. You don’t need to thaw the Chicken before cooking. Just adjust the time of cooking depending on the size of the chicken breast. Cooking frozen chicken breast release more liquid than regular Chicken, so reduce the amount of liquid in the recipe. 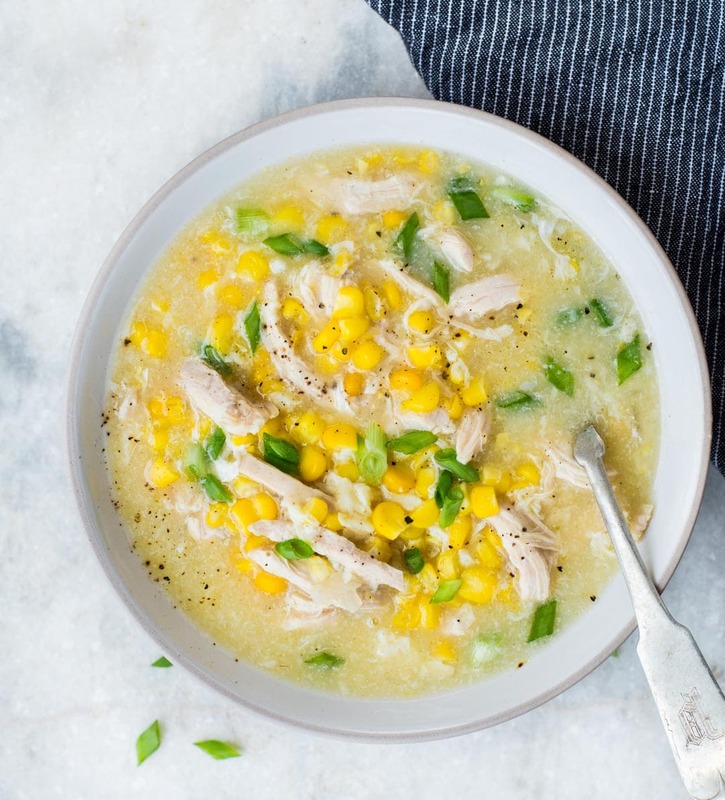 In this Sweet Corn Chicken Soup recipe, reduce the chicken stock to by 1 cup. CAN WE MAKE SWEET CORN CHICKEN SOUP ON STOVE TOP? Before I got my Instant Pot, I used to make this soup on the stove top. The whole process is the same as the instant pot. You need to adjust the cooking time of Chicken breast. Use a heavy bottom pan to make the soup. Thick and Creamy Sweet Corn Chicken Soup is an Indo-Chinese Soup that takes just 20 minutes to make from scratch. 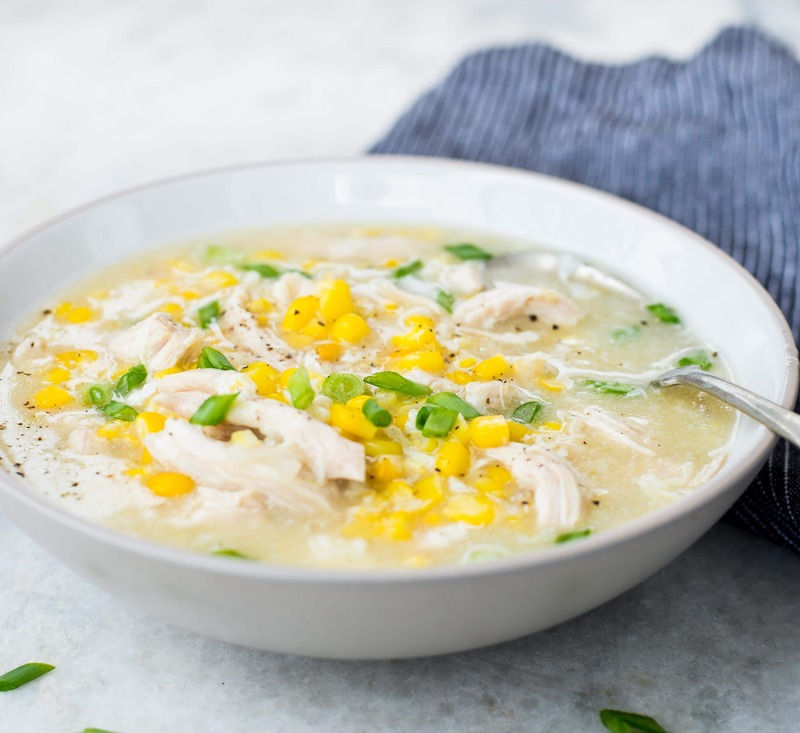 Watch the detailed video to learn how to make this easy Corn Chicken soup in an Instant Pot. Stove Top instructions also included in case if you don't have an Instant Pot. Set Instant Pot in Saute mode. Once the timer is off and the sign says 'ON', add oil. When the oil is hot, add chopped onion. Cook for a couple of minutes until it has softened and looks translucent. Stir in ginger and garlic. Saute for a minute, until the raw smell is gone. Pour in Chicken Stock. Season with salt. Add Chicken Breast to the pot. Close the lid. Set to 'Manual Mode' and 6 minutes. Put the vent to sealing position. Let it cook on high pressure for 6 minutes. When the countdown is over, let the pressure release naturally for 10 minutes. Then do a quick release. Remove cooked chicken using a spatula and keep aside covered. Mix cornstarch and water. Stir gradually to the soup using a slotted spoon. Let it come to a boil. At this point, the soup will start to thicken. Beat egg using a fork. Stir slowly to the soup in two parts. While pouring the egg using one hand, keep stirring the soup slowly and continuously with a fork in another hand. Let the soup get cooked for a minute. Meanwhile, shred chicken using two forks. Add shredded chicken to the pot. Followed by Soy Sauce. Mix everything well. Switch off the Instant Pot. Adjust seasoning. While serving sprinkle green onion on top. Take a heavy bottom soup pot. Follow the first 4 steps as above. Close the lid and let the Chicken Breast in low-medium heat for about 8 minutes. Once the Chicken is cooked through, remove and keep it aside. Follow step 8-12 as mentioned above. Switch off the flame. Adjust seasoning and serve. We dont get creamed corn here can i just use normal corn or maybe add some cream? Normal corn and Cream should work. You can roughly chop a few corn kernels while adding too. “10 best Winter Soups” ebook free!